Prior to setting up your aquarium, it is a good idea to spend time planning the best location and how you want the aquarium to look. Determine what equipment you need, and have all the items on hand so your set-up will run smoothly. If setting up a new aquarium, the fish will not be added for a couple of days. Please read the important section titled: Quarantine. Determine the best site for the aquarium. This needs to be close to a power point, and away from natural light and cold drafts. Too much light will cause excessive algae growth in the aquarium. An ideal site could be a dark part of the room, and if an aquarium light is fitted, the aquarium could beautify an otherwise dim area. This will give you control over how much light the aquarium receives. Warning: Once the aquarium is filled with water, do not attempt to move it, otherwise a breakage will result. Only move an aquarium when the water and the rocks have been removed. Clean and/or rinse the aquarium with fresh water. Never use soaps nor detergents, as these are toxic to fish. The stand/cabinet upon which the aquarium will be positioned will need to be strong enough to support the weight of the fully set-up aquarium, and be level. A sheet of polystyrene foam (10 mm thick) should be positioned under the aquarium to protect the aquarium's base. Cut the polystyrene foam to the same size as the aquarium's base. If you are using an Undergravel filter in this aquarium, now is the time to install the filter plates and airlift stems. Follow the manufacturers instructions when installing the filter. It is recommended every filter plate has an airlift stem attached so that adequate circulation is achieved. If you are going to keep fish or crustaceans which like to dig in the gravel, position the rocks directly on the base of the aquarium, prior to the gravel being introduced. This will make the rock structure stable. If the rocks are placed on top of the gravel, they can be undermined by digging. This could result in a dead fish or a cracked aquarium base. Undergravel filters are not suitable if the aquarium is to house fish etc which will dig in the substrate (gravel). To clean the gravel for the aquarium (grain size approximately 3 mm), place a small amount in a clean bucket (say 1/4 full), run water from a hose into the bucket and stir the gravel with your hand to agitate dirt particles. Tip the bucket over carefully to pour out the dirty water and repeat this procedure until the water remains clear. When the gravel is clean, gently place it in the aquarium. Do not rub gravel against the glass as this will cause scratches. For an undergravel filter system to function correctly, the gravel should evenly cover the plates with a depth of at least 50 mm. Slightly slope the gravel downwards towards the front of the aquarium. This improves the appearance of your display. In a marine aquarium, shellgrit is substituted for the gravel as a substrate. If aeration ornaments are going to form part of the decoration or you want an airstone positioned in a special location, now is the time to install it. The airline can be concealed with the gravel and held in position by rocks. Special airline fittings (joiners, tee pieces, four-way connectors, valves/taps) are available from Aquarium and Pet shops. Some micro-irrigation fittings (4 mm barbed) are available from Rural & Agricultural Suppliers, and these are suitable to use with airline tubing and may be of better quality. A variety of plastic background designs are available, and these are attached externally to the rear glass of the aquarium. Some manufacturers print on both sides of the plastic sheeting, so you have a choice of which one to use. There are designs available to suit marine aquariums as well as freshwater. These backgrounds add interest to the aquarium, and they conceal the wall behind the aquarium. In many cases, there are power cords and airline tubing hanging down the back of the aquarium and these can be unsightly. The plastic background conceals these from view. It is also possible to attach a natural looking background inside your aquarium to make it look like a natural riverbank. Polystyrene foam, polyurethane foam, acrylic paint, epoxy fibreglass resin, silicone sealant, sand, and peat moss can be used to build a truly impressive display. A number of different techniques and materials are currently being used by experienced aquarists in Australia. This type of background is usually only attempted by experienced aquarists who are striving for a natural looking underwater habitat for their fish. Next add any rock decoration. Inert rocks, preferably smooth, are a better choice than rough ones. Smooth rocks look more natural, and your fish will be less likely to injure themselves. Due to regulations, please do not remove rocks from natural bushland. If you are obtaining rocks from private property, ensure you have the owner's permission. Fill half of the aquarium with water. As mentioned earlier, the type of water you use, can determine what fish you will be successful at keeping. If you do not want the gravel disturbed while filling the aquarium, carefully pour the water onto a plate or a plastic sheet. A gentle spray from a hose is another effective method. The aquarium is now ready to have plants added. Live aquatic plants look great in an aquarium if they are healthy and growing. If they are sick and dying, the aquarium will suffer and it will look depressing. I recommend beginners to use plastic plants. If plastic plants are used, there are less things to go wrong - they are not going to die and pollute your aquarium. There will be less work involved in keeping your aquarium clear of decaying plant matter. Once you have gained knowledge and experience with keeping fish, you will be better prepared for the challenges of successfully growing aquarium plants. When positioning the plants, arrange the taller plants at the rear and sides, smaller plants towards the front and low spreading plants in the foreground. Group the same species of plants together as this looks more pleasing and natural than a quantity of different looking plants all mixed together. Arrange the plant groups so that colours and leaf texture and style contrast with one another. To give yourself some ideas, look in some good quality aquarium books which feature planted aquariums. When arranging the plants, take into account where any equipment will be positioned (eg. Heater, Internal power filter, etc). Don't be afraid to change your mind when positioning the plants. Take some time to stand away from the aquarium, maybe sit down, and critically look at your design and decide whether it would look better arranged some other way. Sometimes just slightly rotating a plant will make the aquarium look more attractive. Plastic aquarium plants are a good choice for a beginner. They will not die, and the fish cannot destroy and eat them. The plastic plants currently available are very realistic (many are based on actual aquatic varieties) and behave in a similar manner to the live ones (eg gently sway with the water currents). Different sizes are available, so it is possible to create a beautiful underwater garden. The plants come in natural colours, or you can choose from a number of iridescent ones - depends on personal taste and decor. I personally avoid bright, fluorescent colours because they look unnatural and the fish do not wear sunglasses. You may feel the price of plastic plants are expensive when you compare with the price of live plants (especially the cheap varieties), but when you think about the overall situation you will change your mind. Let me explain. When you purchase a plastic plant, you can expect it to last for at least two years. There is no dead organic matter to place a strain on your filtration system. If you add up the price of live plants you will replace in the future because the conditions are not appropriate, and the additional labour to remove the decaying matter from your aquarium, the cost will have exceeded the price of purchasing plastic plants initially. If you have a limited budget, you can purchase small quantities of plastic plants over a period of time. If selecting live plants, ensure you are buying true aquatic species. Some plants sold at retail shops are not true aquatic species and will die after being submersed in water. This may take a few weeks, but they will die. Live aquatic plants need special requirements to flourish. They need adequate and appropriate lighting, a suitable substrate fertilizer (specially developed for aquarium use - never use agricultural or garden fertilizer), and no mechanical aeration (air bubbles) as this forces carbon dioxide out of the water. Carbon dioxide is required by the plants to photosynthesise. The aquarium will need to be fully planted with live plants to have the best chance of success. The fish selected for an aquarium containing live plants, must be compatible and suited to such a display. Due to the amount of knowledge and specific products required to grow live plant successfully, it is recommended you obtain knowledge and experience before attempting this type of display. Some members in your local aquarium society will probably have the necessary knowledge and experience to assist you with how to grow plants - ask them for help. The filter unit/s can now be placed in position. Please read the manufacturer's instructions so the filter units are installed correctly and properly maintained. Please keep these instructions in a safe location for future reference. As mentioned above, if you are using an undergravel filter, the filter plates and airlift stems had to be installed prior to the introduction of the gravel. There are a variety of filters available, some operate from an air pump while others are electrically driven, and the size purchased will depend on the volume of your aquarium and to a smaller degree, the fish you intend to keep. Timesaving hint: Write the volume (eg 52L) on the end of the aquarium with a suitable pen / felt-tipped marker for future reference. This will save you having to re-calculate the volume each time you need to treat the aquarium with a remedy etc. It is quite common to see in an established aquarium, two different filter units operating. If selected correctly, these filters will compliment one another with very good results. The added advantage is if one filter unit fails, the second unit is able to maintain the aquarium in a satisfactory condition until repairs are completed. When selecting filters, choose good quality brands and ones that are easy to maintain. The filters are a very important part of your aquarium. If you are going to keep tropical fish, and the temperature in the cooler months where the aquarium is located, drops below say 21° C, you will need to purchase an aquarium heater and a thermometer. The size (wattage) of the heater will depend on the aquarium's volume. These heaters are internally controlled by a thermostat and therefore will only operate when the temperature decreases below a set level. Most heaters have a control knob / dial located at the top which allows you to select the temperature setting. An acceptable temperature range for most tropical fish is 21° to 28° C. A setting of 25°C would be fine. Read the manufacturer's instructions and keep for future reference. The aquarium can now be completely filled with water up to approximately 15 millimetres (mm) under the strengthening ledges (where fitted) at the top of the aquarium. If you have used water which contains chlorine, you will need to add a chlorine neutraliser to make it safe for fish. Again, follow the instructions on the product's container. The glass covers can be placed on top of the aquarium. Covering the aquarium has many benefits. It prevents a large quantity of dust and particles entering the aquarium. Fish are prevented from jumping out and water evaporation from the aquarium is decreased. Aquarium lights and the cabinet's hood are protected from moisture damage. The aquarium lights can be positioned on top of the glass covers on the aquarium. An electrical timer can be very convenient to automatically switch the lights on and off. If you work during the day and want to enjoy watching your fish of a night, this can be easily arranged. Determine what time you want the lights to go out, say 11:00pm. A normal day length is say 10 to 12 hours would be suitable. Set you timer to switch on at 11:00am and switch off at 11:00pm. This will save you having to remember to switch the lights on and off and your fish will appreciate the routine. The air pump will need a location somewhere higher than the aquarium. This is important to prevent the back flow of water if there is a stoppage to the power supply. If the airpump must be located under the aquarium, run the airline for a distance well above the aquarium to prevent any chance of backflow occurring. Otherwise, special check valves can be installed in the airline to prevent the backflow of water. These are available from the Aquarium and Pet shops. If using check valves, purchase good quality types, as the cheap ones may jam and not allow air through. All equipment can now be switched on and checked. It is a good idea to have a safety earth leakage unit installed on your electricity circuit. If touching the water or carrying out work in the aquarium, it is advisable to turn off the power to the heater. When you have finished, remember to switch the heater back on. Allow the aquarium to settle for a couple of days before introducing any fish. During this time the temperature and filter units can be checked. In a newly set up aquarium, the filter units are not biologically mature. It takes at least a few weeks for beneficial bacteria to increase in numbers sufficient to handle the amount of waste generated by the fish. During the first few weeks, it is important not to stock the aquarium with too many fish. Only introduce a small number of hardy fish and this will help the filters to mature. During this period, conduct a 25% water change at least weekly for the first three weeks after the fish are introduced. When you purchase aquarium fish from an Aquarium or Pet shop, it will be placed in a plastic bag. Place this bag in a protected location, while transporting it to your aquarium, so that it does not get hot nor cold. A polystyrene box with a close fitting lid is a good choice as it is insulated and the dark surroundings will help settle the fish. Float the bag containing the fish in the water for about 15 minutes to allow the temperature inside the bag to equal the water in the aquarium. After this is accomplished, open the plastic bag and add a small quantity of water from the aquarium into the bag and reseal the bag. Wait for at least 10 minutes and then add some more water. This allows the fish to gradually acclimatize to the new water conditions. After this has occurred a few times, release the fish by tipping over the plastic bag and gently pour the fish and water into the aquarium. It is wise to quarantine all new fish before they are introduced to an established aquarium. The quarantine period can vary, but I would recommend at least three to four weeks. A smaller, secondhand aquarium is ideal for quarantine purposes. It will need aeration, a small filter and if it is used in the cooler months, a small heater. The quarantine aquarium will need to be set-up at least a few days prior to obtaining new fish. All new fish, whether obtained from a friend, or purchased from your local shop, should be placed in quarantine. This separates the new fish from your established display and gives you a period of time to determine if the fish is free of disease. It is recommended to conduct a 25% water change twice each week. 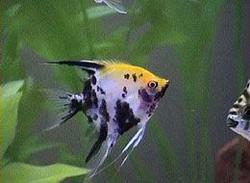 Aquarium fish become stressed when being caught and transported. This stress can affect the immune system of the fish and make it more susceptible to diseases. White spot disease is quite common and usually brought on by a sudden decrease in temperature. A number of newly acquired fish could be affected by this disease. 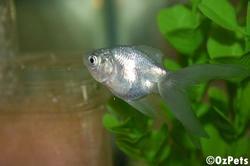 If the fish in the quarantine tank do develop a disease, it can be easily treated. The volume of water is less and therefore, less medication is required. If you are not successful with treating a disease outbreak, it is less depressing to lose a small number of newly acquired young fish in a quarantine aquarium, than a large number of mature fish in an established display aquarium. 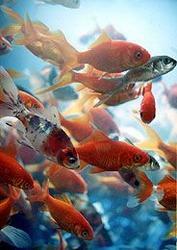 If your fish have a disease, dose the quarantine tank with the relevant medication and follow the directions. Remove any dead fish immediately. Once the fish are cured of the disease, leave the fish in the quarantine aquarium for at least another fortnight to confirm all the fish are healthy. If after the quarantine period, you are confident your fish are healthy and have no disease, you can transfer them to your established aquarium. Use the plastic bag and follow the procedure detailed above under the heading: "Introducing fish".